Jesse Purcell, a member of the Kenton Parks and Recreation Board, outlines budget requests to help improve the city’s park system and swimming pool. Priorities for Kenton’s parks were discussed during a Volunteer Appreciation Dinner hosted by city leaders on Tuesday evening at Mid-Ohio Energy. Jesse Purcell, a member of the Parks and Recreation Board, saluted all the volunteers, whether they have worked on the parks or in other areas of the city. “I hope we can continue to count on you as volunteers,” she said. Purcell said the board has created a five-year strategic plan for the city’s parks, but highlighted three priorities they want to address. The No. 1 priority, she said, is Pioneer Park, located along East Franklin Street (Ohio 309). “It’s a great place to start creating the atmosphere we want to share in our community,” Purcell said. The board wants to remove unsafe playground equipment and broken limbs in the park. They want to add mulch and flowers, plus maintain the existing historical markers. A goal for 2020 is to add picnic tables and trash cans. She said they want to remove the unsafe playground equipment and target teenagers with the addition of a basketball court with hoops and possibly a volleyball court, along with picnic tables. The municipal swimming pool is the third priority, with refinishing the bathroom floor the top goal. That project is estimated at $12,000 to $15,000, plus the board wants to replace a lifeguard chair as well. Those costs are part of a projected $30,000 in funds the board will be seeking from the city. The rest of the money would be for park maintenance and new equipment. 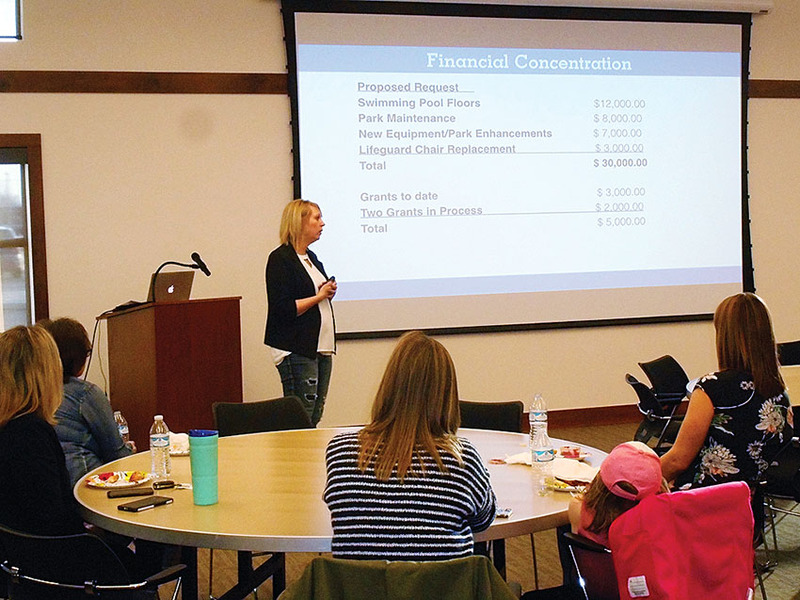 Purcell said the parks and recreation board has received a $3,000 grant and has requests for another $2,000 in the works. She said in order to attract new people to the city they need to have something to do. Improving the parks is a first step. Building community and generating pride in the parks is a goal of the board, she said. Ideas include creating a community of movement to provide a place in the parks for people to do yoga and Zumba. Purcell they also have discussed creating themes in parks, possibly using animal figures to increase interest, not just from local residents, but people driving through the community.